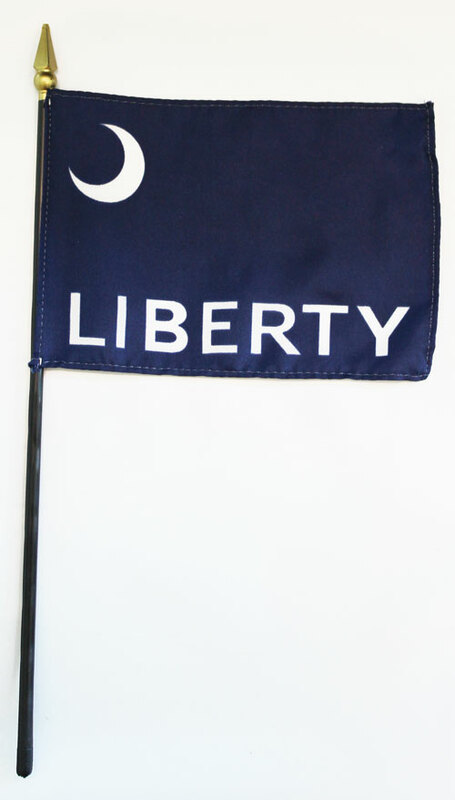 Our 4" x 6" Fort Moultrie stick flags are made from a high quality, silk-like polyester fabric. They feature a hemmed flag mounted on a black plastic 10 inch staff with a gilded spear point. These versatile stick flags can be used on tabletops and desks, to wave in parades, or to decorate flower arrangements. On Sept. 13, 1775, Colonel Moultrie received an order to take Fort Johnson, South Carolina. He had this flag made, for the troops wore a silver crescent on the caps inscribed 'Liberty or Death.' 'This was the first American flag displayed in the South,' he said. On June 28, 1776, the crescent flag, with LIBERTY across it, was raised at his defense of Sullivan's Island, later Fort Moultrie.